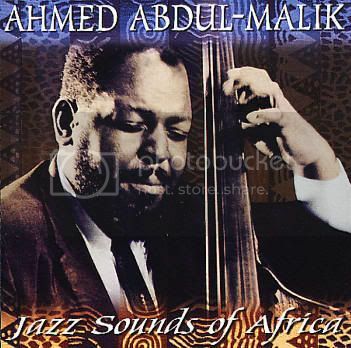 Coltrane, Monk and Ahmed Abdul-Malik, "Five Spot club." This record is also an important document of Benny Golson and Johnny Griffin's endless ability to adopt new sounds for their tenor. While Lee Morgan seems a little bit uneasy in the bizarre set, Griffin/Golson blow with a complete confidence. East meets West is a more daring album than Jazz sounds of Africa, in both instrumentation and choosing the material. While Jazz sounds tend to be a more western , EMW has more east than west. Ahmed, Originally Sam Gill (according to Richard Cook), or Jonathan Timms (Feather/Gitler encyclopedia) was born on January 30th 1927 to Sudanese parents in Brooklyn and grew up in the borough’s Arab neighborhood. 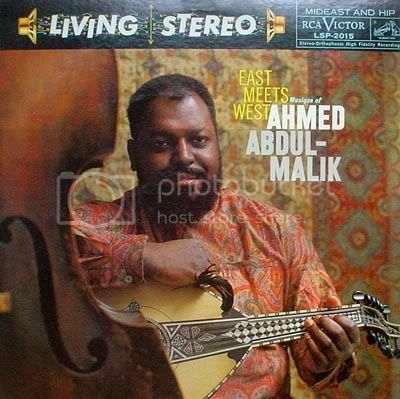 According the most recent edition of the Rough Guide to Jazz he did not change his name to Ahmed Abdul-Malik in the mid-50s but was given that name at birth. He started studying music at age 7; first violin then bass, piano and even tuba. His first jobs as a musician were when he was still a teenager and included symphony orchestras and different ethnic weddings. 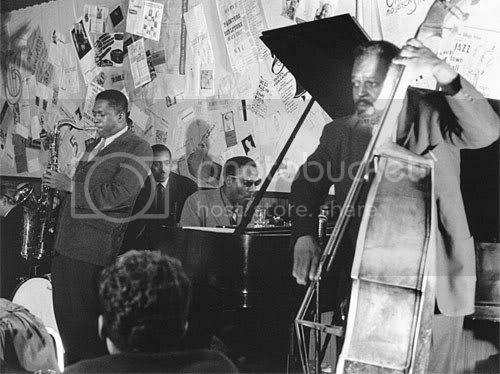 In the mid 1940s he was introduced to the jazz community through his friend Randy Weston and played bass in jazz and r&b bands. 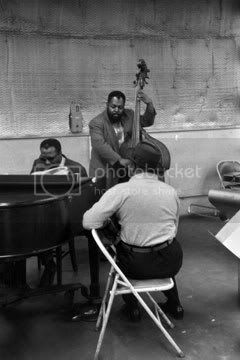 He played with Art Blakey, 1945; Don Byas, 1946; Sam Taylor, 1954; Herbie Mann, 1961; Earl Hines, 64, but his most famous gig was as Thelonious Monk’s bassist in Five Spot jazz club. He studied Middle Eastern music with Jamal Islan and Niam Karakind and Indian music with Dr. Wanamasa Singh. Performed non-Western music at New York City gallery in 1957. 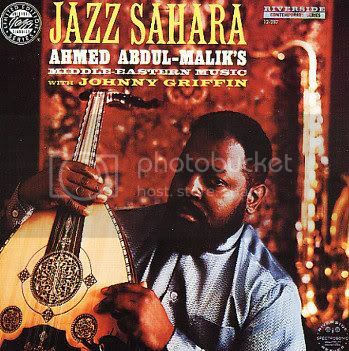 Started experimenting with the oud in the mid 50s and recorded on it with Johnny Griffin and with John Coltrane. He also cut a few records as a leader where he played the instrument. He also appeared on TV shows (Sound of jazz, '57) both as a bop bassist and with his own group playing Middle East influenced jazz on the oud. He headlined the first major African jazz festival in Morocco in 1972 and also toured Latin America. From the 1970s he was on faculty at NYU and at Brooklyn College. In 1984 BMI recognized his work by giving him Pioneer in Jazz. He died on October 2nd 1993 in Long Branch New Jersey. Ahmed Abdul-Malik (bass, oud); Andrew Cyrille or Rudy Collins (drums). Van Gelder Studios, Englewood Cliffs, New Jersey. This only Ahmed's record available from Amazon. Fantastic piece on this interesting and elusive artist.